A decorative concrete overlay can transform your dull concrete floors into a sophisticated and gorgeous surface that you’ll be happy to show off to guests or clients. Phoenix concrete floor coatings can make your home garage look like a professional space. They can make your business work space or waiting area look more inviting to make a better impression on clients. Concrete floor coatings also protect your floors. They provide a barrier that keeps debris from staining your floors and makes it easier to clean your floors. Dark hardwood floors can make a space feel more luxurious, and the same is true for darkly stained concrete floors. Think mahogany, charcoal gray, and wrought iron. These dark stains can make a concrete floor seem more sophisticated, and they can make the entire room seem more elegant. Dark stains also hide dirt nicely. They can be good choices for homes that get a lot of foot traffic or for busy garages that are not able to keep up with the constantly cleanup. Natural stone has a gorgeous look that people love. But natural stone is also very hard to maintain – especially in a space that gets a lot of traffic or that is used for heavy duty work. Concrete can get the same look with the right decorative overlay. The milky polish that leaves behind a finish similar to natural stone is one of the top trends in Phoenix concrete floor coatings right now. The finish provides a natural beauty that works in many spaces, whether for the living room in a high-end Arizona home or the main floor of a commercial garage. No matter what color you’d like for your floors, you can get it in a smoky finish with a decorative concrete overlay. Like a dark brown floor but don’t like how dull a floor can look when it’s just foot after foot of the same color? You can get a decorative concrete overlay that looks like smoke billowing through the stain – with splotches in different shades that provide visual interest. You can achieve the same affect with just about any color. The darker the color, the more pronounced the affect will be. Gray is one of the hottest color in interior décor right now, and concrete floors are no exception. We’re not talking about the dull, dusty gray of the natural concrete. We’re talking about glossy concrete floor coatings in varying shades of gray, including everything from a soft, dove gray to a stately charcoal. You can choose from solid gray stains, milky finishes, or overlays with a smoky affect. Choose a gray stain that will match your overall décor. Gray walls are also popular, as are gray wood stains for cabinets and shelves. But you can also match gray stains to just about any other color wall paint or furnishings. It’s a versatile color, which is likely what has made it so popular for concrete floor coatings near Phoenix. You have a lot more options than you may think for concrete floor coatings for your Arizona home or business. There are a variety of colors, finishes, affects, and even textures. You can even make your Phoenix concrete floors look like certain kinds of stone. You need to hire a professional to apply the coatings so that you get the long-lasting results and a great look for your floors. 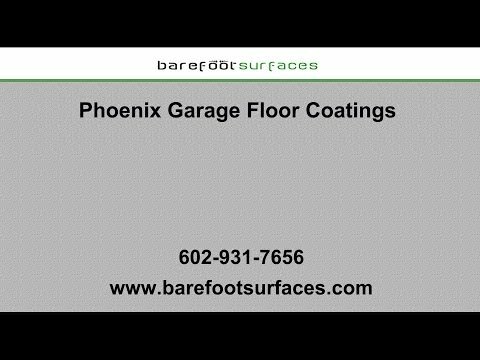 Barefoot Surfaces in Arizona specializes in concrete floor coatings. We have multiple options for a decorative concrete overlay, as well as other types of coatings, including metallic finishes. We can stain your concrete or simply seal it. Any of these services will improve the look of your floors and make them easier to maintain. You can choose coatings for your garage, your lobby, or even your living room. Anywhere you have concrete floors, you can benefit from decorative concrete floor coatings. View our gallery online to see what’s possible, and then contact us in Arizona to get an estimate for your job.